According to the Chinese Zodiac, 2015 is the year of the Sheep. Really not seeing that on the farm. This is the first year since I started raising sheep that all of my breeding ewes were not bred. Rather than the 20 plus lambs I normally have, this year I had eight. It is, however, the year of the Chicken. 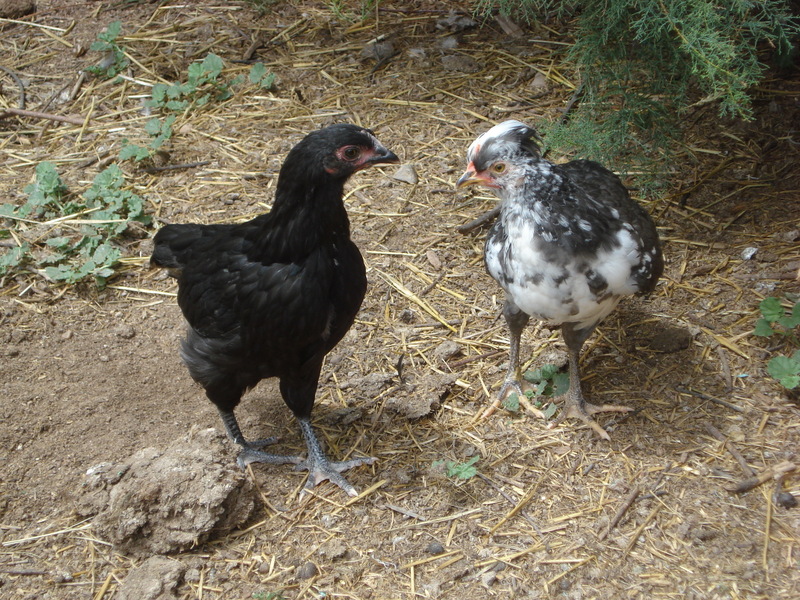 I have had multiple hens go broody, starting with my first hen showing up with two chicks in tow. She unfortunately lost both those chicks, but the second hen hatched out eight chicks and those are doing very well. Hen number three hatched out seven but lost two within the first few days. While what I’ve read says that all eggs in a nest will pip out within 36 hours, that isn’t necessarily true. The chicks in this clutch were hatched over a week span so the oldest chicks are considerably larger than the youngest as demonstrated in this photo where the smallest can still spend the night snug and warm underneath mom while the oldest has to resort to sleeping on top of her. Hen number four was not so lucky. She hatched out one live chick, with two that were unsuccessful in pipping out. 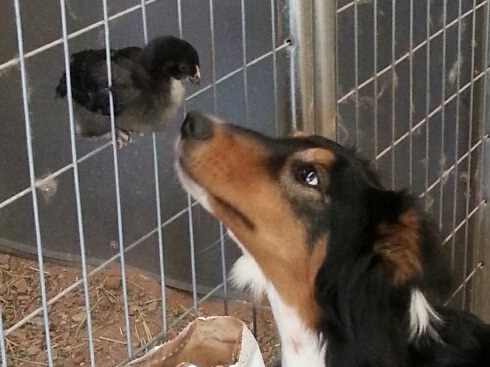 Since she hatched her chick several feet off the ground in the hay stack, I moved her and her chick into a dog kennel in the barn. That worked for the first two weeks but then she started roosting on the top of the kennel and her chick, who couldn’t make it to the top, would roost as high as it could fly (it is now roosting on the top of the kennel) and from there it was inevitable that she would start taking the chick on walkabouts. Then hen number five showed up with seven chicks in tow that she had hatched somewhere on the property. She is down to five chicks but those are growing rapidly. A couple of days ago I went out and found hen six was showing her eight chicks the ropes. It will be interesting to see how many she successfully raises. One of the reasons I had looked at Icelandics was to get chickens that would go broody and raise chicks. 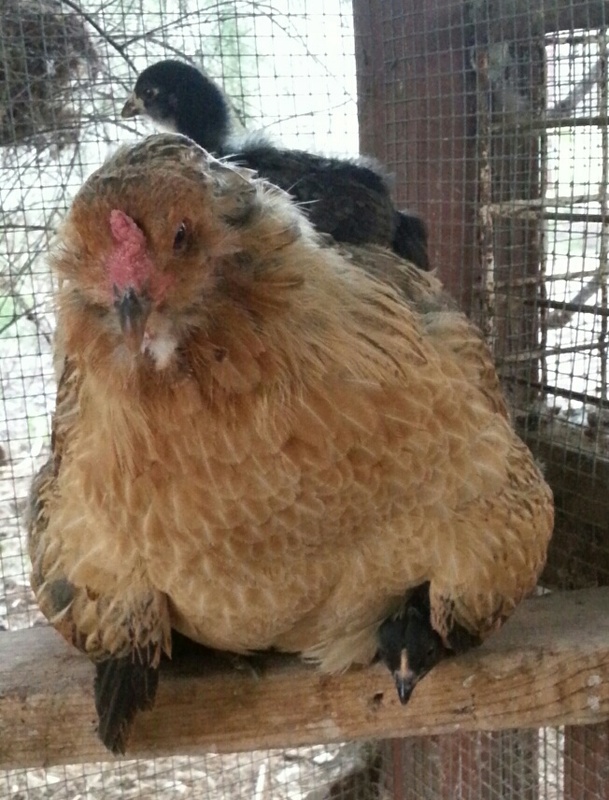 It is a really good thing that some of my hens decided to go broody this spring as the attempt to incubate the Icelandic chicken eggs I had shipped pretty much failed. Out of 18 eggs, only six hatched and four of those didn’t survive more than a couple of days. However, the two that did survive are doing well and I turned them out with the other chickens a couple of days ago. It will be interesting to see if I get any hens out of the 29 chicks or if I’ll end up with a freezer full of chicken instead. My dogs tag along at chore time as young pups and gradually are asked to help when help is needed. Just as important is the dog learning when NOT to jump in, offering assistance. Sidhe learned two lessons this morning. First she learned that fresh sheep placenta is delicious. Second, and more importantly, she learned that ewes who have just lambed are dangerous. During lambing season I limit the number of dogs that accompany me at chore time to lessen the stress on the sheep. Tuck, my right hand, comes with me more often than not but this morning I took Sidhe with me when I went out to feed. As I approached the sheep pen with the ewes that haven’t yet lambed I saw a ewe cleaning off a lamb. Once I reached the pen I realized that she had a second lamb on the ground and another ewe had a single lamb on the opposite side of the pen. I made a quick detour to the lambing jugs. I had moved the two ewes that had lambed on the 5th, and their lambs, out of the lambing jugs and into the nursery pen Friday afternoon and cleaned out the jugs so just needed to re-bed the jugs, and fill water buckets and hay feeders to prepare the jugs for new occupants. As I was heading to the barn for hay, I looked back to check on Sidhe and saw her stick her head through the fence and grab a placenta. She quickly pulled her head back, just as the ewe rammed the fence. I left her happily chewing and made a quick trip to the barn. Once the lambing jugs were ready I threw some hay to the ewes without lambs and then went into the pen to move lambs and moms. One of the twin lambs was alert but unable to stand. I picked him and his twin up, and with mom following me, moved them into the lambing jugs. A quick check of the lamb revealed no muscle tone in his hind legs. * Sidhe, very sensibly stayed out of the way. When mom was happily munching on her hay, I went back to the main pen to move the ewe with the single lamb. She was less willing to leave the rest but eventually did follow me and her lamb into the lambing jug. I had only pulled the wire panel closure behind her when the ewe followed me in, thinking the ewe would be content with the hay in the feeder. I was with the first ewe and lambs when Sidhe started running up and down outside the lambing jugs. Not surprisingly, the ewes both became upset and I told Sidhe down. She promptly laid down just outside the entrance to the lambing jugs. Evidently the second ewe felt threatened and the next thing I knew, Sidhe was screaming bloody murder. The ewe had pushed her way through the wire panel and gone after Sidhe. Being a smart dog, Sidhe had broken her down and run. However, she didn’t realize how fast or how determined a ewe with a new lamb could be and the ewe chased her halfway across the working pen before Sidhe circled back to where I was trying to get out of the first ewe’s lambing jug. The second ewe hit Sidhe just as Sidhe came along side the wire panels making the front of the lambing jugs. I was sure Sidhe was seriously hurt given her vocalizations and hurried to run interference with the ewe so Sidhe could escape. She did run out of the working pen but stopped less than ten feet away, standing quietly and waiting for me. After I got the ewe back with her lamb and closed off the lambing jug I called Sidhe to me expecting to find some injury on her. I was very happy to discover she was in one piece. I was also very happy to see that Sidhe was showing no signs of being afraid to come back into the working pen or to pass close to the sheep in the other pen. *The lamb is still not able to use his hind legs. He pulls himself along with his front legs and has learned how to prop himself up to nurse. Addendum: This post was written on March 8, 2014. The lamb finally managed to stand on his feet a couple of days later and I thought all would be well, but he died the next day.